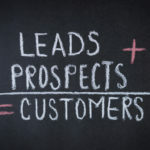 Successful Twitter campaigns start with realizing that using Twitter for business to generate leads and prospects is the way to go, especially in establishing almost instant credibility in an industry. To get you started, here are some basic steps on how to setup a Twitter account and some Twitter best practices used by Sounds Serious Communications as part of a social media strategy for an event organizer. Why is a Twitter social media strategy important? 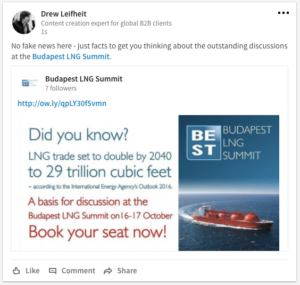 It was not easy convincing my client that we should use a Twitter account, arguably the hottest tool in B2B social media, to promote her energy industry event. She told me that “people just don’t use Twitter” in our market. And I said that was exactly the point – we weren’t trying to reach Twitter users in our country, but to reach potential international guests that would come to our energy conference here in our beautiful capital city. I showed her my Twitter account that has 1,600 followers, most of whom come from the energy sector in Europe, and explained that once I had the proper name, description and other information in place (my Twitter handle used to be called “@Oil&GasMan”) on my page, I was miraculously followed by all sorts of people in the industry without a lot of effort. Sure, I did Tweet occasionally, mostly with links to my own published articles, but had also been sharing interesting industry articles I’d read. Wondering how to gain followers on Twitter? It’s been a few weeks since we’ve started Tweeting for my client, and after following 690 people and organizations in the oil and gas industry, 180 of them have followed us back. The first thing they see is our beautiful banner advertisement, which is a photo of Budapest’s scenic Chain Bridge overlaid with information about our event. The great thing is that people and organizations just seem to follow you back once you’ve shown them your “colors” – what your subject matter/area of expertise is and what you’re going to be Tweeting about. 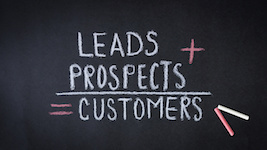 Leads and prospects appear magically before your eyes. Renowned oil & gas analysts, for example, immediately friended us back and offered to speak at our event – a good start! In my approach to setting up this client’s Twitter, I was really lucky to be able to capitalize on my own account, because I had slowly-but-surely cultivated a wide range of energy industry people and organizations. This made it easy in that I was able to follow my own account with the new client’s account and be able to selectively follow the recommendation for whom to follow. And I continued that effort by following as many other relevant Twitter accounts as possible, adding a bunch each day. Having the two Twitter accounts also gives you the chance to interact between them, so we are using our own Twitter account to like and retweet things that have been shared by the client account. It gets the ball rolling. I use this hashtag for most Tweets and hope it will become popular among our followers. This experience reminds me of messages we disseminated on a public radio station I worked at. While we staff grew tired of saying the same things over and over, those were the takeaways for our listeners. Integrating that thought into Twitter means that one shouldn’t feel sheepish about Tweeting the same article, promo, picture, etc. more than once, because, in the same way we repeated stuff on the radio ad infinitum, you never know when your followers will see the content, so it pays to program multiple Tweets with social media scheduling services. You may be wondering, “can you schedule Tweets?” You sure can, and it’s pretty easy to learn how to do it. I’m monitoring news items that other organizations are sharing about this industry. My objective is to see how I can tie in our region – Central & Eastern Europe – to the news or developments in these articles, so I’m re Tweeting with a reference to how those developments could be beneficial to our region. To be honest, I think this industry takes itself a bit too seriously. It’s a serious subject and is sober and a bit dry. As a marketing person with knowledge of this industry, I am trying to be catchy and a bit superficial, because, after all, our endgame is that we are trying to promote an event. So I think it’s a good opportunity to come up with some provocative ideas and catchy wordplay that will stick in people’s heads, things like wordplay, rhymes, or using interesting snippets of information. Another thing that is an incredible opportunity on Twitter is the ability to message people and organizations directly through a Tweet by including their Twitter handle in the text of the Tweet. One especially effective Tweet I’ve done for this client included the handle of a company whose representative will be giving an address at our conference, because this company is featured in the article I’m sharing. So I thanked the company directly and publicly, mentioning that their expert will be divulging more details on the subject at our conference. They typically “like” the Tweet and sometimes even share it to their own network. Once you’ve got the hang of how to schedule Twitter posts through schedulers like Hootsuite, you can start pushing some adverts in the form of nice images that are lightly designed with the details of your event. It’s important to test any such visual content to make sure the images are the right size for Twitter and that you’re using the right sized font and color to make sure that vital information is visible on a laptop and on mobile. Bring out the BIG guns – do Twitter poll questions! I was just about to call it a day on the Internet when I picked up a book I’m reading on marketing and read a couple of pages, one of which suggested “Commission a piece of research that is important to your customers.” Badda bing! What’s the quickest piece of research you can commission nearly IMMEDIATELY? A poll question on Twitter. It’s like wildfire! You won’t believe what happens when you write and post one. Of course you need to know the subject matter to be able to write a provocative poll question, but if you do it really takes off. For my client, I asked which infrastructure developments would have the greatest effects upon the markets in their region in the next 5-10 years. Within 45 minutes, 86 Twitter users answered my poll question, which was also liked and shared about a dozen times, too. We also picked up a dozen or so followers in the same time period. We take a lot of care in making sure to keep our own personal biases to ourselves for social media clients. Stick strictly to business. It’s also important to be as careful and as objective as possible with the client’s topic. While, on the one hand, we are striving to be provocative and eye catching, on the other, it’s not in anyone’s interest to alienate potential clients. That should get you started on your Twitter marketing strategy. However, if you don’t have time to deal with setting it up, we’d love to show you how to use Twitter for marketing, so if you have any questions, please feel free to contact Sounds Serious Communications. Check out Sounds Serious on Facebook.